‘Reject austerity or face rejection by voters,’ Jeremy Corbyn advised European sister parties on a trip to the Netherlands in July. 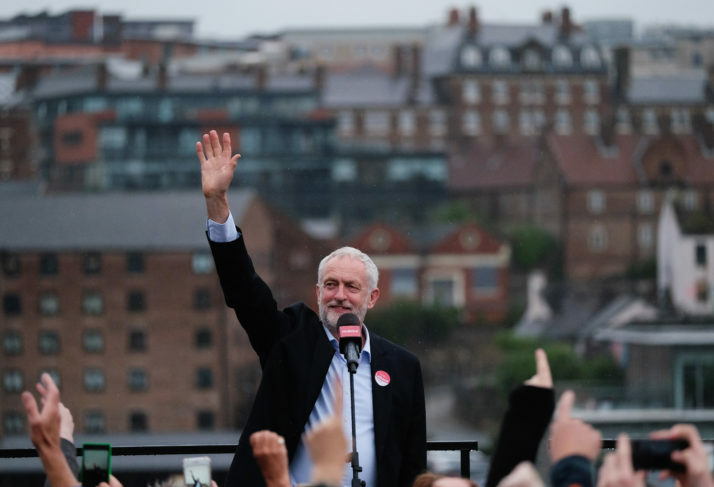 Corbyn’s trip, with his bold and confident message, is one of numerous signals that the British left can, and must, play a leadership role in building a renewed and expanded progressive internationalism. In order for the left to win, this new internationalism must stretch beyond policies and relationships between party leaders and states; it must also forge mutually supportive networks of solidarity amongst grassroots organisers and activists pushing for progressive change. With social democratic parties across Europe in woeful decline, it is little wonder that so many are looking to the UK, where the Labour Party is bucking the trend. Whether seeking to understand the difference a bold, socialist manifesto can make, or learning from the innovative, volunteer-driven campaigns run by the Labour Party and Momentum, progressives across the globe are looking to the UK for inspiration, support and cooperation. Of course, nobody is suggesting that we have all the answers here; huge challenges loom ahead and we have much to learn from our peers across the world. But with its recent gains, the British Labour movement, from top to bottom, is well placed to foster stronger international networks of mutual solidarity and support. Since the 2017 General Election, there have been various welcome signals that a renewed internationalism is emerging at all levels of the Party and wider movement: from the Labour leadership and National Executive Committee (NEC), to the organisers and activists of the movement’s grassroots. This cannot happen soon enough. What Owen Jones dubs the ‘Far-Right International’ is also on the rise. The ‘Free Tommy’ movement is becoming a growing threat on British streets and the emboldened hard right is on the ascendency in the Tory Party. Steve Bannon, Trump’s former advisor who praised Mussolini, is touring Europe and wealthy ‘alt right’ extremists in the US are looking to fund a British far right resurgence. All the while, Trump is the US president and openly racist parties are winning votes across Europe. In this climate, internationalism cannot be some lofty ideal; it has to be a fundamental pillar of our collective strategy now. The left must work together within and across national borders to combat the threat of the far right. We must learn from – and support – left parties and movements across the globe in this struggle. And we must champion an internationalist politics that can take on the far right’s racist and misogynistic nationalism. As Jones makes clear, ‘Only a left that offers a genuine alternative – to hold powerful vested interests to account, rather than scapegoating migrants and Muslims – can hope to defeat this political poison’. Even Labour members and supporters who have been critical of Corbyn or Momentum in the past must recognise that it is the Labour Party under its current leadership that is bucking the trend across Europe. Similarly, Bernie Sanders, who represents a similar politics to Corbyn (both in political substance and their movement-based approaches), is consistently polling as the most popular politician in the USA, and the most likely person to beat Trump at the next election. All those who fear the rise of the far right should embrace ‘movement-style’ politics and a genuinely transformative political programme. As two of the co-founders of Momentum, we both worked as National Organisers from the organisation’s launch in October 2015 until after the 2017 General Election. In the year since, we have each spent time working with organisers and activists across Europe, North America and Africa, sharing our experiences from the UK context, and gaining first-hand insights into the dynamism and creativity propelling grassroots movements and campaigns across much of the globe. These experiences, both in the UK and abroad, have made two core principles abundantly clear. First, it’s the policies, stupid. If we are going to win, the political offer has to be bold and transformational – ‘offering solutions as big as the problems we face’. And second, the organising approach must also be ‘big’ – embracing movements and building systems to empower volunteers to drive the campaigns at scale. This article will explore how these two core principles – ‘big politics’ and ‘big organising’ – are being expressed in different contexts across the globe. We highlight some promising examples of where mutually supportive, international cooperation is strengthening progressive causes and argue that only by sharing our experiences and learning from each other’s struggles does the left have any chance of winning. ‘Big politics’ is the call for a bold alternative vision of the future. This must start by recognising the very real pain and indignity that the status quo inflicts on vast swathes of the population. For many years, a general criticism has been lobbied at politicians that they’re all the same. According to the Child Poverty Action Group, ‘more than 1 in 4 children grow up in poverty in the UK’. Prior to Momentum, we both taught in different schools in parts of Birmingham with high levels of poverty and deprivation: children coming to school hungry, families stressed out and struggling to get by, support services slashed. For the many people living in such difficult circumstances, technical-sounding policy announcements tinkering at the edges of systemic problems aren’t going to cut it. The solutions being offered must be as big as the problems they seek to address, or why should anyone believe that voting this way or that way is going to make any material difference to their life? This isn’t just about ‘talking left’. It’s about socialist and social-democratic parties viewing their role as serving human need over profit and putting forward aspirational political programmes to rebalance wealth and power in the interests of the many. The way this is communicated is key, and it needn’t conjure images of unsuccessful attempts in the past; it entails a positive, creative, inclusive vision of the future for generations to come. The difference between the Labour Party’s performance in 2015 and 2017 is a case in point. The 2015 manifesto which promised to ‘cut a bit less’ won just 30 per cent of the vote. Two years later, the ‘For the Many, Not the Few’ manifesto saw Labour increase its vote share by the largest amount since World War Two. Building a million affordable new homes (50 per cent council property), tax rises only for the wealthiest 5 per cent, free higher education, and a national education service providing free, lifelong education for all were more than just sound policies in and of themselves; they were indicators of the alternative society we could live in under a Labour government. Many activists and organisers across the world point to the UK Labour Party as an example of the change they wish to instigate in their own socialist and social democratic parties. Unfortunately, with a small number of exceptions, there are few party leaders who are showing any serious signs of changing their strategies. Take the German Social Democratic Party (SPD), as an example. Attending a fringe event organised by the Friedrich Ebert Stiftung, the political foundation of the SPD in January 2018, Emma observed a widespread despair amongst the members. The Party was in the middle of internal debate about whether to back Angela Merkel’s ‘Grand Coalition’ (GroKo) for the third time, despite the SPD’s support having declined dramatically during the previous coalition years. In fact, it had obtained its worst result in the history of the Federal Republic the previous September. The main argument in favour of the GroKo, peddled largely by the party establishment, was that it was the SPD’s responsibility to do what was in the ‘national interest’, which, they argued, meant bringing stability to Europe’s largest economy by forming a government and saving the country the turmoil of another election. The counter arguments, which were largely advocated by the ‘Jusos’ (youth section) and the party’s left, asserted that the SPD had lost its identity and needed to be in opposition to begin a process of soul searching and political renewal, citing the UK Labour Party as an example. Furthermore, they argued, if the SPD entered government, it would leave the racist, far-right Alternative for Germany party (AfD) as the main opposition in Parliament, awarding them a greater platform. Taking inspiration (and some practical training) from Momentum, the NoGroko Campaign is estimated to have signed up 20,000 new members before the deadline and dented the pro-Groko vote by approximately 10 per cent from 2013. The neoliberal economic model, which social democracy sought to soften and humanise, no longer works. It is on a global life-support system consisting of $12tn of central bank money ... Until the centre-left learns to break with the logic of neoliberalism, and to construct an economic model that subordinates market forces to human needs, it will continue failing. The task is not to remedy or tweak the neoliberal economic model but replace it – just as fundamentally as Thatcher, Reagan and Berlusconi did in the economic counter-revolutions of the 80s and 90s. Parallel debates are happening across the Atlantic in Canada, where grassroots activists are calling on their political leaders to follow Sanders’ and Corbyn’s example and adopt a ‘big politics’ strategy. On the eve of the New Democratic Party’s (NDP) federal convention in February 2018, 450 peoplegathered in Ottawa (with over 5000 joining by livestream), with a loud and clear message to the party’s newly elected leader, Jagmeet Singh: radical politics are not a liability for the progressive left in Canada, but rather the path to power and victory. We both attended the gathering, along with Marsha de Cordova (Labour MP for Battersea and Shadow Minister for Disabled People) and Becky Bond (senior advisor to Bernie Sanders during his presidential campaign and co-author of Rules for revolutionaries: How big organizing can change everything. Similarly to the ‘No Groko’ activists in the German SPD, members of the NDP’s grassroots pointed to the UK Labour Party’s revival and enhanced electability since adopting a bold, transformative policy platform with Corbyn’s leadership. The event was co-hosted by The Leap and Courage. The Leap is an organisation co-founded by Naomi Klein and Avi Lewis amongst others, aiming to tackle the intersecting crises of our time: climate change, racism and inequality. Similarly to the 2017 Labour manifesto and Bernie Sanders’ platform, The Leap reflects a ‘big politics’ approach, setting out a positive vision for an alternative society that could be within our reach. It is the product of a two-day gathering of Canada’s Indigenous rights, social and food justice, environmental, faith-based and labour movements. The ‘Courage to Leap’ event ended in a Bernie Sanders-style ‘barnstorm’. A barnstorm is a ‘big organising’ technique (which will be explored later in more depth) with the aim of getting as many people as possible to sign up to volunteer for a campaign to do impactful work. The barnstorm recruited hundreds of volunteers to kickstart Joel Harden’s campaign to become the Member of Municipal Parliament (MMP) in Ottawa Centre. Months later, Harden unseated the Liberal incumbent with an energetic grassroots campaign of 1,200 volunteers, led by ACORN organiser, Jill O’Reilly. This is one example, localised as it may be, of how international support and shared learning can strengthen progressive causes and campaigns. Harden is a supporter of The Leap and when questioned about his ‘radical politics’, he argued, ‘when some people were accusing me personally of being radical, what I thought they were saying was reckless, that my ideas were reckless. And to be honest, what I find reckless is modest solutions to climate change, what I find reckless is putting teachers in classrooms with 31 (junior and senior kindergarten) kids, and having teachers get hurt in the process’. A common criticism from the political establishment and so-called ‘centrists’ (who gets to define where the centre ground is?) is that we are currently living through a time of political extremes: on the one hand, there’s the far right, on the other, the far left. Where are the sensible, grown-up politicians of the centre? We would argue that there’s nothing extreme or divisive about seeking to find solutions to meet the scale of the problems we face, with the goals of ensuring that all people are able to live with dignity and that our societies function cohesively. This is rather different to the scapegoating, demonising and hate-fuelled politics of the far right which seeks to tap into fear and anxiety rather than hope, optimism and collaboration. Continuing to nullify and stagnate the political process whilst undermining the attempts of the progressive left to build a better future only makes it more likely that the far right will gain ground. The status quo isn’t working for an ever increasing number of people; it’s time to take stock, rethink and get behind something that will. Originally published in Renewal. To support their work and to receive the whole journal every quarter, please subscribe.